Morphous owners on this Forum? 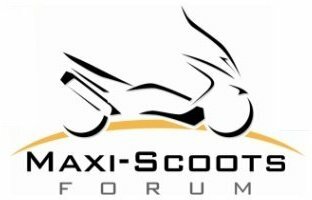 Maxi Scoots > Bike Maintenance/Questions > Yamaha > Morphous owners on this Forum? Re: Morphous owners on this Forum? I just joined the ranks of the Morphi! I picked up the one Sevenwheels had. Long term plans are go through it and hopefully to ride it next year in the coast to coast Cannonball Run. 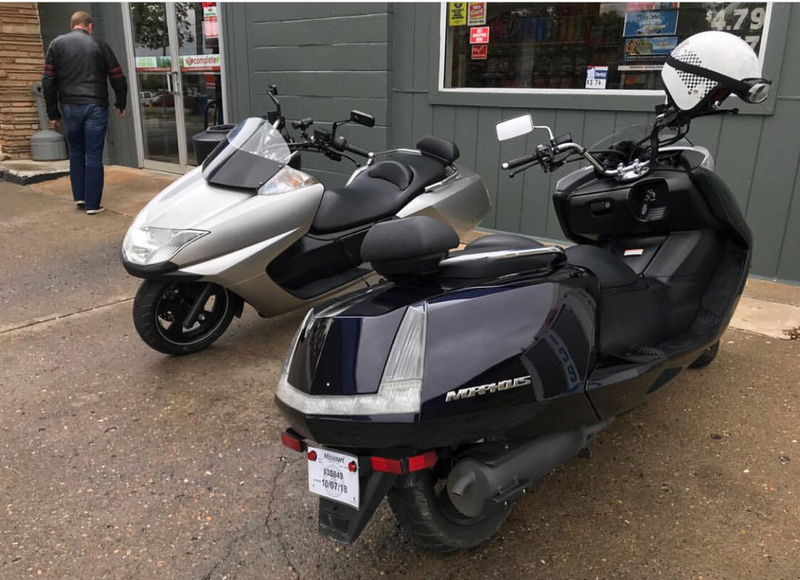 Since they have limited the size of the scooters for the run to 250cc and under, I figure that this would be the most comfortable option for that. Although it looks good in black, I think while it's apart, I'll get it painted. I'm open to any and all suggestions as to color. Now, according to shewhomustbeobeyed, I have to thin out the herd. She can't understand why I need the Goldwing, Burgman, Majesty and the Morphous. You have to have the right tool for the job. Everybody knows that. Try this or I have a brand new never been out of the box Cee Bailey tall dark windshield for sale, ordered it then sold bike before I received it. Thanks DavO! Do you think it has the Yamaha graphic on it? Couldn't get ahold of anyone on the phone who could their hands on it (partzilla). 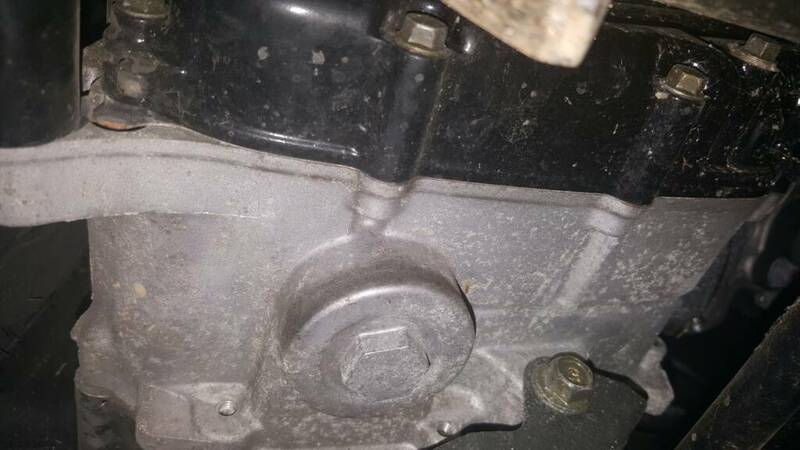 Although the following linked post is from an engine coolant change thread, the oil drain plug (hexagonal, facing downward) appears in the photo at the lower left. The image shows where the nearby metal is partially cleaned off after a recent oil change. Ok so it's the big one underneath. Doxies ain't pets, they're family! The oil change is easy peasy. That's the one. Like the old tires you replaced, the oil may be just as old. Replacing is a good move. Good advice from Bugsplatz on the filter, too. Doesn't require removal of any body panels, either. Pics of my new to me Yamaha Morphous. The aux. lights are coming off it as the 8 amp draw is too much for the OEM stator, so much so that it affected the spark at the plug and performance not to mention battery charging. Retroreflective SOLAS tape and yellow dots added just to make me look like more of a scooter geek. I added a bargain tail box from Amazon mounted to a custom rack made from 4 feet of SOLAS tape covered angle iron with a cross brace bolted to the existing rail with all stainless hardware and mounting area neatly covered with neoprene "seatbelt covers". Rack can be removed with 6 bolts and holes easily concealed with chrome carriage bolts and barrel nuts. As my new daily driver the additional storage is more important to me than the boxes negative impact on its appearance. The only thing I found to be below standard on this scooter is the brightness of the brake light which I would likely upgrade if I did not have an added high brake lamp as part of the new tail box spoiler. I may add some Skene lighting systems to both front and rear if I can find a stator upgrade or mod that can handle it. Paid $1100 for it with 2100 orig miles on it. Thanks for the pictures. Looks great! I appreciate the enhanced visibility additions to your ride. Seems like you found a great deal as well. Thanks. Hoping to find another local Morphous or Majesty rider to do/help with maintenance/upgrades together. Also looking for someone(s) to do a civilized(meaning slow) scooter camping tour from Portland/Seattle/BC area to Denali in Alaska after this coming winter season. I have an OEM Morphous factory windshield in excellent condition(2100 miles) for sale or trade. I can vouch for the quality of the Cee-bailey windshield I am using now and have no need for this part. Congratulations on the Morphous purchase, freak! Thanks for posting the pic, Maggie. Two in the same pic is more than twice as nice. Thanks Maggie my buddy aaron drove to south Dakota to get his a couple weeks ago. Dave Obrien came buy the shop and I bought his windshield from him. i sold my morphous last summer. i was sad to let it go but i just didn't have the room for it. down to 2 hd's and 2 honda ruckus now.